DHANDAMANE, SOMALI REGION, ETHIOPIA, 23rd October 2013 – As we drive through the Valley of Marvels between JigJiga, the Somali Regional capital, and Babille, which straddles the neighbouring Oromia Region, the emerald glow of vibrant plant life sits in stark contrast to the florescent copper shimmer of the soil below. The road is smooth tarmac and carves a winding path through the sparse moonscape. 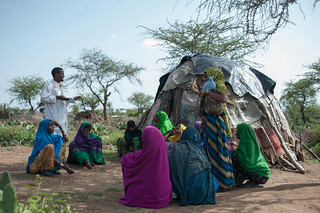 This western tip of what is classified as one of Ethiopia’s four developing regional states is currently blessed with more precipitation than its eastern extremities, but drought, regular disease outbreaks, flooding and limited access to healthcare have blighted the majority of the region for a number of years. Adawe Warsame is a Health & Nutrition Officer with UNICEF. Having grown up in the nearby city of Dire Dawa and a Somali himself, he is well aware of the historic complications of the region. “The issues the people face in the Somali Region are multi-layered,” he explains. “In one part of the region there is a flood, which is followed by a disease outbreak; in another, severe drought. This has a huge impact on both the health and nutrition of the people here, as well as the ability of the government to provide adequate services. The next morning we continue along the same road through Babille towards Dire Dawa, entering the Oromia Region, before leaving the asphalt and turning back on ourselves towards the Koro kebele – a more direct access road does not currently exist. Our driver first has to remove branches from the road, which have been placed there by the neighbouring Oromia village. After a brief exchange, in which they question why the support is being provided solely to the Somali people, they help to clear the path for us. With regional governmental offices only responsible for their own kebeles, this is a common occurrence. 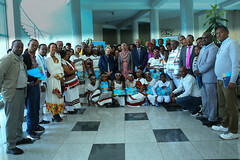 By working closely with the Ethiopian government, UNICEF are able to mitigate such issues and access areas that others cannot. The MHNT helps to train Health Extension Workers (HEWs) through a 16 package programme, which includes disease prevention and control, family health services, hygiene and environmental sanitation, health education and Harmful Traditional Practices (HTPs). They also provide immunisations, deliver medicine and supplies, support Traditional Birthing Assistants (TBAs) and treat severe malnutrition. UNICEF currently supports 24 MHNTs in the Somali region. There used to be others operated by different NGOs, but due to financing restrictions these have now ceased to be operational. As we arrive in the village, we are met by Mohamed Almur Musu, the kebele leader, who informs us that he is responsible for protecting both the people and the animals in his community. Adawe briefly explains the purpose of our visit before we begin to make our way through the village. One of the biggest and often most sensitive issues in the region is HTPs, such as early childhood marriage and female genital mutilation (FGM). 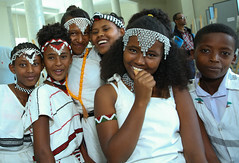 According to the 2011 Welfare Monitoring Survey (WMS) report, the region has the third highest rate of FGM (in 0-14 year olds) in Ethiopia (31%), after Afar (60%) and Amhara (47%). Beyond the obvious initial pain of the procedure, the long term physiological, sexual and psychological effects of FGM are well documented. The consequences can even include death as a result of shock, haemorrhage or septicaemia. Long-term complications include loss of libido, genital malformation, delayed menarche, chronic pelvic complications and recurrent urinary retention and infection. Girls who have undergone FGM or also prone to various complications during birth and are more at risk of contracting HIV. “We now have a very strong community stance against it. I can confidently say that it is no longer a part of our lives here,” Mohamed exclaims proudly. 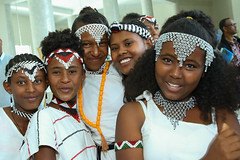 At the first Girl Summit – held on July 22, 2014, in London, and joint hosted by UNICEF – Ethiopia’s deputy Prime Minister (DPM) Demeke Mekonnen announced a package to eradicate both FGM and early childhood marriage by 2025. This is the most recent step in a decade’s long struggle, but statistics are now starting to indicate that real progress is being made and this new target is a realistic one. The house we are borrowing shade from is that of Marayama Abdiwahad, a confidant woman who plays a central role in the kebele’s women’s group. She has a 13-year-old daughter, Bisharo, and is clearly driven by a desire to improve the quality of life for all children in her community. In addition to the hygiene aspect of the 16 package programme provided to the community, Marayama also discusses the role the women’s group has played in eradicating FGM. When questioned about her own daughter, Marayama is defiant. 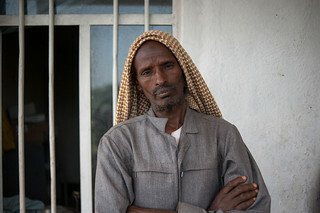 Abdullah Abiid, 22, is the kebele’s only HEW. He has been working in his role for a year now. When we meet him, he is discussing HTPs with the kebele’s women’s group. “FGM no longer happens here,” he informs us proudly. “There is still early marriage, but now the girls are going to school and learning about this too.” At times, the progress has not been easy, but Abdullah is committed to achieving his objectives and improving life for all in his community. “Some listen and accept what I am saying straight away, others laugh at me,” he says. “When they laugh, I don’t stop what I am doing because I know they will see what the other women are doing and follow their lead. The progress in the level of hygiene and the eradication of HTPs is part of a bigger picture, whereby both the health and quality of life of all those in the community is improving – especially for girls. The training and provision of clean delivery kits to TBAs has had a profound impact on the quality of birthing services, and this has been supported further by Tetanus Toxoid injections, which massively reduces the neo-natal tetanus mortality rate. The presence of the Health Post (HP) and MHNT for emergency situations also enables pregnant women to have more confidence should complications occur. In the neighbouring Helobiyo Kebele, Ruman Ibrahim Osman, 28, is a prime example of the impact this has had. 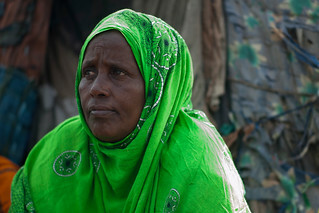 We are invited into her home where she is sat holding her 1-week old baby girl, Farhiyo. She had previously lost two children during complicated deliveries. She had also lost another child in similar circumstances just 12 months earlier. With Farhiyo, however, the delivery was much more straight forward and she received support throughout her pregnancy. She is also now receiving continued support from the TBA and HEW. Although there is still some way to go to completely eradicate HTPs from the Somali region and to improve the health and nutrition of all, positive progress is clearly being made. For those working with UNICEF in the region, this is something that they are proud to be a part of. 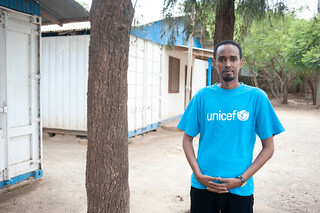 “As someone with an educational background in public health, it brings me great pleasure to see these poorer communities now learning such important lessons,” Adawe exclaims gleefully back at UNICEF’s Somali regional office in JigJiga. “The people here do not deliberately want to hurt or damage their children.